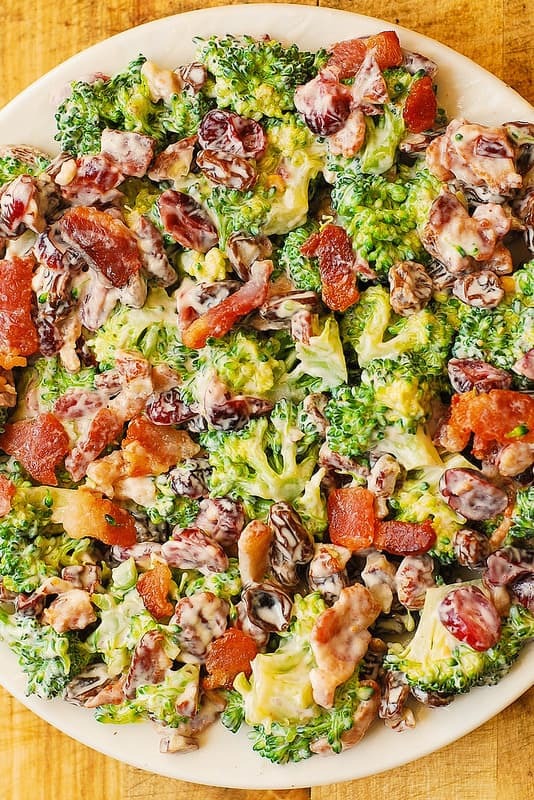 Broccoli Bacon Salad with Pecans, Cranberries, Raisins – healthy, DELICIOUS, gluten free salad, packed with fiber! If you never tried pecans in a broccoli salad, you should as soon as possible! 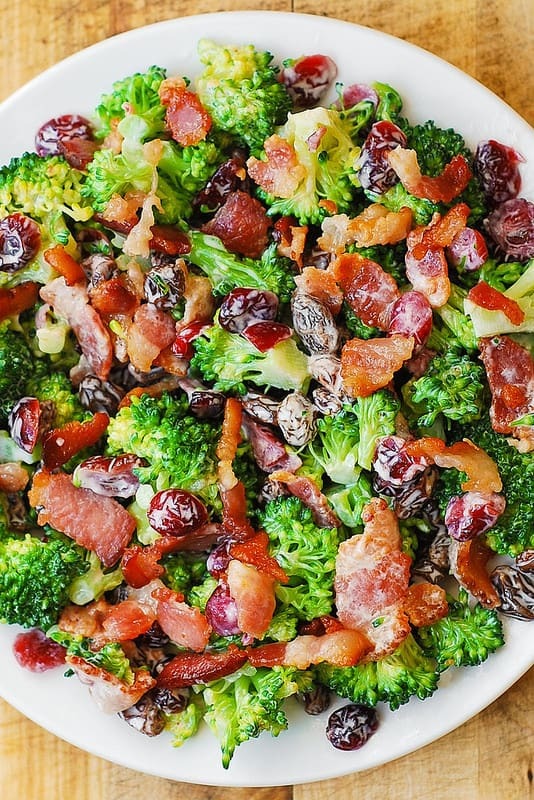 Crunchy pecans together with the dried fruit, bacon and broccoli are an amazing combination. If you love nuts and dried fruit – this is a great recipe for you! I like to rehydrate dried cranberries and raisins in boiled water so that they are plumper and more tender to taste. I also like to slightly toast pecans in the oven before adding them to the salad – watch the pecans while they toast, because the pecans can burn easily. Because the salad is heavy on cranberries and raisins, you don’t really need a sweet dressing – 2 tablespoons of honey added to the simple homemade salad dressing should be just the perfect amount! Do not add all of the salad dressing at once. Add the salad dressing gradually to the bowl with the salad ingredients. Some people like lots of dressing on their salad, some don’t – let your taste be your guide just how much dressing to add! You might not have to use all of it. 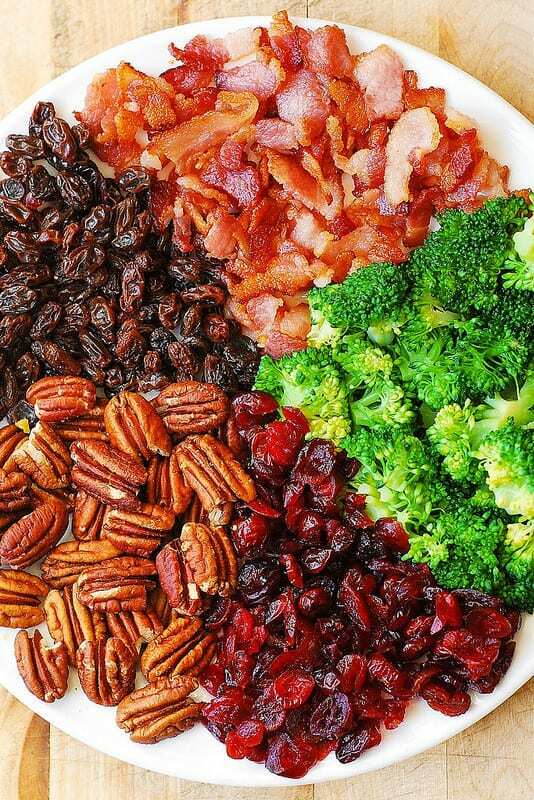 Broccoli Salad with Pecans, Cranberries, Raisins, and Bacon - healthy, DELICIOUS, gluten free salad, packed with fiber! Rehydrate dried cranberries and raisins: place cranberries and raisins in 2 different bowls, pour boiling water over each set of berries until they are covered. Cover with the plastic wrap and let the berries sit covered, for about 15 minutes, to absorb water. After 15 minutes, drain the cranberries and the raisins thoroughly from the water using the colander. If you like, toast the pecans in a preheated oven at 350 F for about 5 minutes. It's an optional step, but it really adds flavor. When toasting, make sure to check the oven often, as pecans toast pretty fast and can turn too dark easily. 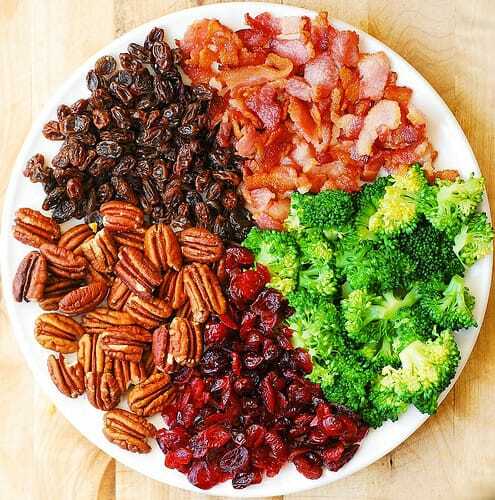 In a large bowl, combine chopped blanched broccoli, chopped cooked bacon, pecan halves, dried cranberries and raisins (both berries rehydrated per step 1). In a medium bowl, combine mayo, milk, 1 teaspoon apple cider vinegar. Heat honey to a more liquid state and add to the salad dressing. Mix well and taste to see if you need to add more honey. Note: Keep in mind that the salad is heavy on cranberries and raisins which should add more than enough sweetness so you might not need extra honey. Gradually add the salad dressing to the large bowl with the salad ingredients. Some people like lots of dressing on their salad, some don't - let your taste be your guide as far as how much dressing to add!